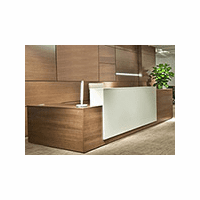 Customize a reception desk for your business’ workspace! When a client or prospect first enters your office, your reception desk is likely the first place they go. Your reception area sets the tone for their experience with your company, so you need to make sure your reception desk makes a positive first impression. One way to do this is to order a custom reception desk that fits your space and matches your office’s aesthetic. By selecting a custom-made reception desk from Modern Office, you can make a small front room seem larger or make a spacious lobby seem more welcoming. You can give your reception area a warm, traditional look or a minimalist modern style that reflects your brand and matches the rest of your office furniture. You can also select custom desk features that give your reception is the space he or she needs to work efficiently and stay comfortable. Wrap-Around Custom Reception Desk w/ Left Bridge, 72"x 102"